Filling in a notable dough/sauce/cheese gap in the Sullivan’s Island dining scene, The 450 Pizza Joint offers a casual, Italian-focused option in the former Taco Mamacita’s location. After triumphing over the nightmare that is parking on Middle Street, The 450 welcomes you with a deliberately funky vibe, featuring motorcycle helmet lamp shades and tables decoupaged with photos from vintage music magazines. If you’ve been looking for an opportunity to loudly declare “That’s a-spicy meatball!” count on the four, large homemade meatballs ($14) to provide the stage. Tender and meaty, they’re peppered with fennel seed and possessed of the aforementioned fiery finish. Topped with a light dusting of cheese, they are served in a flavorful marinara that quickly proved impossible to access. Just as one cannot empty the ocean with a spoon, it’s really freaking hard to ladle marinara with a fork. Attempts to gain the attention of my server were exceedingly challenging, despite the moderate lunch crowd. This is also when the water torture began. Apparently the HVAC system is rather leaky. And a lot dirty. Huh. I’d maybe get that checked out by an HVAC professional? In the meantime, I recommend The 450 further add to the unconventional vibe and hand out umbrellas at the door, or maybe provide a small stash of those cheap plastic ponchos in a bowl on each table as 4 ounces of brown water suddenly falling from the veritable sky is a surprise no one needs. Meanwhile, the burrata and fig ($13) came highly recommended by the server, but was a little confusing in execution. A gargantuan amount of chopped figs are topped with fresh, undressed arugula, burrata, and shredded cheese. Three pieces of prosciutto adorn the sides, and it’s all accompanied by eight slices of sourdough bread in a ‘make your own sandwich’ fashion. I didn’t really understand the components, and there’s way too much of everything. Although I appreciate the unbridled generosity, a lower-priced, half-size portion with less of an undressed salad vibe would be more appealing. 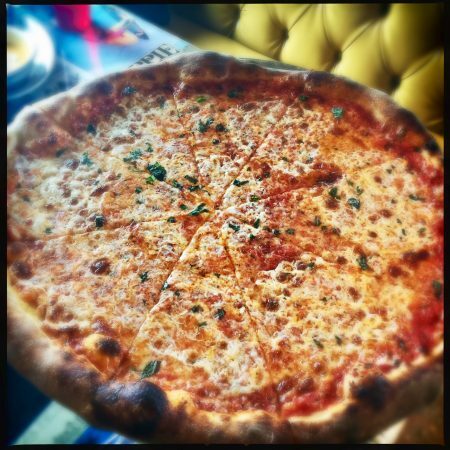 The pizza requires no interpretations and comes in a plethora of options, including a New York-style crust in 14″ and 19″ variations. There are inventive offerings like the drunk pig ($19/$24), made with vodka sauce and fennel sausage, but as a purist, I opted for the DeMarco ($15/$19) topped with a savory house-made red sauce, parmesan, and “Brooklyn mozzarella,” then dusted with finely chopped fresh basil. Make no mistake, 19″ is no small pie, and The 450 makes the most of the real estate. The crust is thin, with a good chew and a nice amount of crisp char. This is about as pleasing as a simple cheese pizza gets. 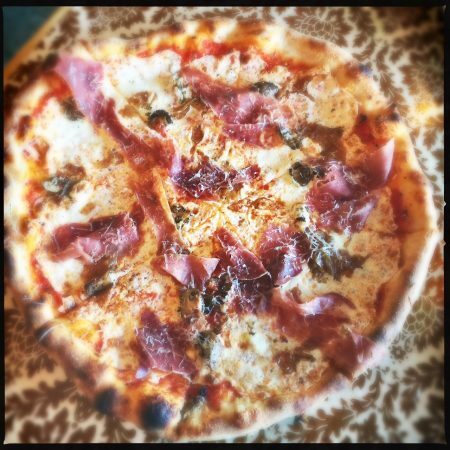 The prosciutto and mushroom ($17) pie is one of the choices on the 450 Originals menu. Available only as a 14″ crust, it features the namesake items along with mozzarella and caramelized onions. Savory and a little sweet, it’s another pleasing pick. Although some of the creations threaten to gild the lily, if your tastes run to elaborate toppings it’s hard to imagine you could go too wrong with any pizza variation here. 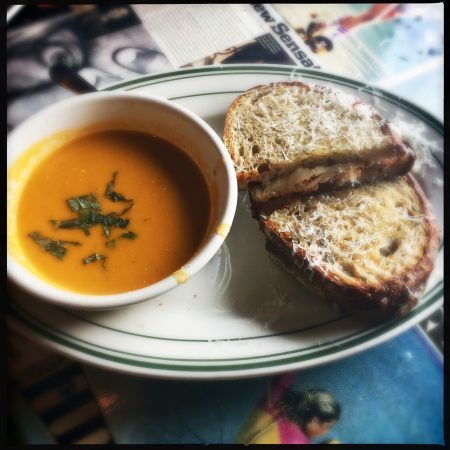 Simply reading the words grilled cheese and tomato basil soup ($10) gets me in the feels, although in hindsight I should have studied the ingredients list a little more closely. The soup itself is homemade, with a vibrant orange color and strong basil flavor. Rich and herbal, it’s an upscale model of the version Mom probably used to reheat. The grilled cheese wasn’t what I was expecting. Made in a panini grill, the shredded fontina and smoked mozzarella weren’t fully melted. The bread is quite firm, yet oily, and the sundried tomato aioli is a touch too heavy on the oregano. It’s a very Italian take on the simple classic, but if you want cheese, starch, and tomato, I’d probably recommend just getting a pizza. In contrast, the hot Italian ($12) hero is spot-on, with salami, capicola, and pepperoni on a soft seeded hoagie roll. Topped with provolone and thinly sliced lettuce and onion, the requisite heat comes from the hot cherry pepper relish. If you’re in the mood for a sub/grinder/hoagie/whatever your background dictates such a sandwich is called, this is everything you could want and more. The accompanying kale salad was fresh and unique, but possessed of an extremely generous — arguably too generous — portion of slivered almonds and craisins. In a consistent ‘go big or go home’ theme, there were more almonds and craisins than kale. Although the salad itself was really quite nice, especially for a side dish, the imbalance of garnishes is puzzling. 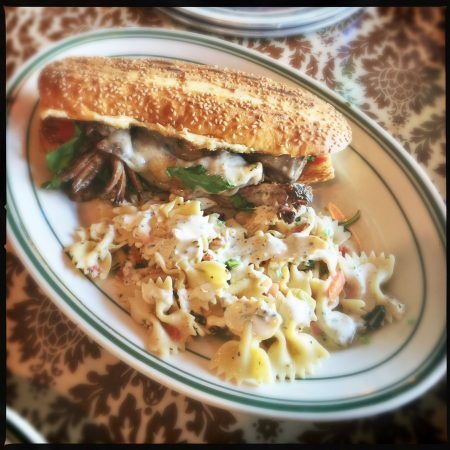 The Chucktown beef ($11) sub is billed as a riff on Chicago-style Italian beef heroes. Assembled on a toasted, seeded hoagie roll, it’s filled with pot roast-esque shredded beef and topped with melted provolone, as well as fresh tomatoes and arugula. Considering the aforementioned proclivity toward whimsical excess, the net effect was surprisingly bland. Although the menu mentioned giardiniera (Italian-style pickled vegetables) and au jus, mine didn’t arrive with either, which may have accounted for the incongruence. The pasta salad occupying the other side of the plate featured bowtie noodles, along with diced tomato and bell pepper bits, plus sliced green and black olives. 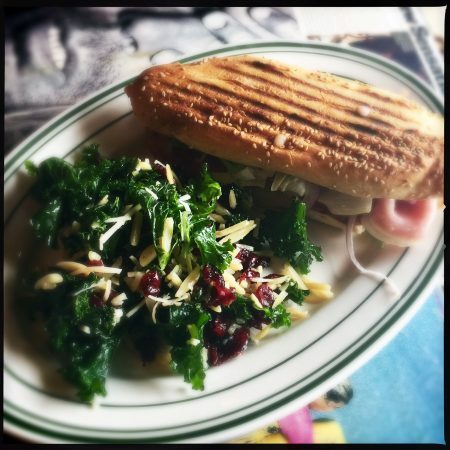 Dressed right before serving, it’s less bland and soupy than the usual and a viable alternative to the kale salad. With some energy injected into the front of the house and a timely visit from a qualified air conditioning service person, The 450 Pizza Joint feels like a shoo-in for success. 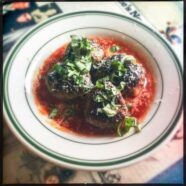 With their approachable menu and strong pie game, it’s likely they will satiate Sullivan’s visitors’ and residents’ dough-based cravings for some time to come.